The Danish composer's music to date has drawn on diverse influences to create energetic, thoughtful works that engage newcomers and thrill aficionados in equal measure. 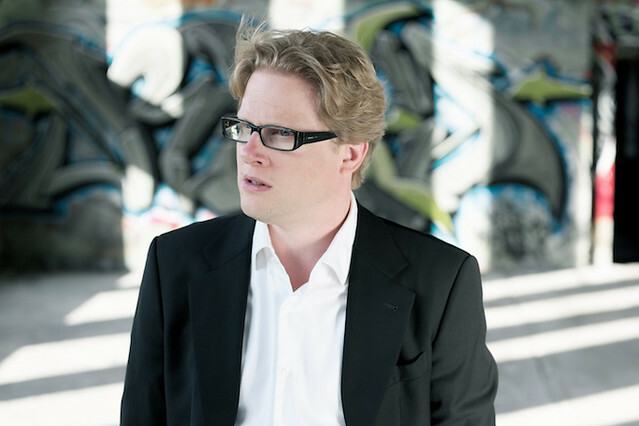 Glare marks the Royal Opera debut of Danish-German composer Søren Nils Eichberg. Eichberg first came to prominence in 2001, when his violin concerto Qilaatersorneq won the Queen Elisabeth Competition, and in 2010 he became Danish National Symphony Orchestra's first ever composer-in-residence. Eichberg has never trained formally as a composer; as a teenager he played both as a church organist and with a punk rock band, and later trained as a pianist and conductor. His diverse musical background is represented in his music, which draws on several idioms – the reckless energy of rock, particularly – told with the craftsmanship of classical composition. Eichberg has worked twice before in opera: the complete work Grete Minde for the Theater der Altmark in Stendal, based on Theodor Fontane's novel about the Thirty Years' War; and two scenes from the experimental music theatre piece TIMESHIFT… oder die Zeit ist ein Vogel for the Münster Municipal Theatre, written in collaboration with five other composers. But the majority of his work to date has been instrumental, ranging from intimate chamber pieces to massive symphonic works. As the work that made his name, Qilaatersorneq must always be a key point of reference. This 11-minute violin concerto, written for Boris Brovtsyn and the National Orchestra of Belgium, is inspired by Greenlandic ritual drum dance. Here Baiba Skride plays Qilaatersorneq in her award-winning performance at the Queen Elisabeth Competition. Another early work is the epic @|/|7|7#35|5| (Antithesis) for solo percussionist and electronics. Here Danish percussionist David Hildebrandt helms an alarming array of percussion instruments in Eichberg's urgent exploration of interplaying textures and sounds. In many of Eichberg's works there's a clear impulse to look across centuries of Western music and synthesize quite disparate elements into a new whole. Endorphin, the 'concerto grosso for string quartet and orchestra', is a clear manifestation of this drive. Eichberg reimagines the Baroque form of a concerto with a group of soloists emerging from the larger ensemble as a string quartet coming from the orchestra – 'partly leading, partly following, partly against each other, partly together'. In 2010 Eichberg was one of 27 composers commissioned by violinist Hilary Hahn to write a short piece for violin and piano for her project 'In 27 Pieces: the Hilary Hahn Encores'. Eichberg's Levitation uses a rising ostinato to give the sense of lifting within a dark, thoughtful work. Eichberg's Second Symphony, 'Before Heaven, Before Earth' was written for Danish National Symphony Orchestra as part of his residency with the orchestra. Buzzing with highly rhythmic energy and spectacular use of the percussion, its four continuous movements rise to a thunderous climax. And what about Glare? The opera is scored for a chamber orchestra of 11 players, who interact with an extensive electronic score fed through speakers surrounding the audience. As with Eichberg's other work, a pulsating rhythmic drive is a key part of Glare's soundscape – the drum kit and bass instruments (double bass, contrabassoon, bass clarinet) all have forthright roles. But soaring above this are sliding violin harmonics and high flute lines, as Eichberg experiments with acoustical 'interference'. As conductor Geoffrey Paterson says, 'Eichberg's music has a visceral impact, grabbing the audience by the ears in the same way that Thaddeus Strassberger's production captivates the eyes'. Glare runs 14–22 November 2014. Tickets are still available. The production is generously supported by the Friends of Covent Garden.